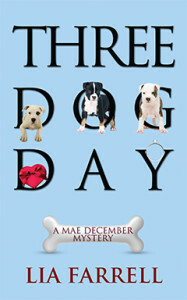 Three Dog Day ($14.95, 286 pages, ISBN: 978-1-60381-971-8), is the third cozy mystery by Lia Farrell in a series featuring Mae December, the successful owner of a dog boarding business in Rosedale, Tennessee. After Mae discovers a dead “John Doe” on a riverbank near an abandoned puppy mill, the subsequent search for answers is far trickier than anyone anticipated. The first two books in the Mae December Mystery series are One Dog Too Many and Two Dogs Lie Sleeping. The series will continue with a new title in 2015. 4 Stars: “Three Dog Day is a wonderful cozy mystery, and a great addition to a lovely series. It is sure to offer a lot of entertainment for mystery fans.” Read more…. It’s bitter cold in Rosedale, Tennessee, the most frigid January in decades. The kind of chill they used to describe as requiring sleeping with three dogs just to make it through the night. Mae December has found yet another body, this one on the banks of the Little Harpeth River. It’s another murder for her boyfriend, Sheriff Ben Bradley, to investigate. Only Mae’s broken her wrist, which makes helping out with the case difficult. That’s okay, because the murdered man was found near a puppy mill, and all evidence points to the owner as the killer. Surely the case will be a slam dunk. Mae’s injury also hampers her ability to run her dog boarding business and care for the three pit bull puppies she’s fostering, so she hires Ray Fenton, the kid who blew the whistle on the now-shuttered puppy mill. Meanwhile, Sheriff Bradley’s office manager, Dory Clarkson, struggles to pass the physical tests that will allow her to fulfill her dream of becoming a deputy, Mae and her friend Tammy are busy planning Tammy’s Valentine’s Day wedding to the brother of Mae’s deceased fiancé, and Detective Wayne Nichols must revisit his painful past as he fights to free his foster mother from prison. Rosedale is the last place you’d expect to harbor a killer. Now the sheriff’s department must solve its third murder in a year. Lia Farrell is actually two people. Mother and daughter writing team Lyn Farquhar and Lisa Fitzsimmons live in Michigan and Tennessee respectively. Both are life-long readers who are also dog lovers. Lyn owns two Welsh corgis and Lisa has one pug and a Siberian husky. Lisa works as a Muralist and Interior Designer and her mother, Lyn, is a Professor of Medical Education. Click here to find them online. She found the nature preserve parking area with no problem. The gravel lot was deserted. Good thing I’ve got a big dog with me. Lulu wouldn’t harm anyone, but she had a look of deceptive ferocity, due to her large size and wild markings. She clipped the heavy duty leash onto Lulu’s collar and found the marker for the blue trail, which Kim had said was her favorite. The big dog surged ahead, sniffing and pausing to pee every few yards. They stayed on the path, following the blue arrows every time there was a fork in the trail, and ended up down near the bank of the Little Harpeth River. The sun was beginning to warm the air, and Mae took off her gloves and paused to put them in her pocket with the cellphone. Lulu tugged hard on the leash suddenly and seemed to be headed right to the edge of the dark, fast-moving water. Mae pulled back on the leash, shouting “Lulu, no!” but she was no match for the strength and determination of the eighty pound dog. Mae stumbled and grabbed a tree to steady herself. The leash slipped out of her grip and Lulu jumped down onto a rock ledge, sniffing at something at the very edge of the water. The hound sat down, threw her head back and howled. Mae got a clear view of what Lulu had been sniffing, let out a scream and jumped down to grab Lulu’s leash. A man lay face down, with one arm trailing in the water. His flannel shirt and brown corduroy pants were wet and covered with debris from the river. His face was turned away, but the skin on his neck and the hand on the side nearest her was a horrible shade of pale blue and dotted with mud. Mae pulled Lulu back and knotted the leash over a branch, then went back to kneel on the rocky ledge by the water. She tentatively touched the man’s hand. It was cold and stiff, like a partially defrosted steak. Mae gagged, tasting coffee and the protein bar she’d had earlier. Standing back up, she swallowed convulsively and shook her head. Mae took several deep breaths. There was nothing she could do for this poor man. No ambulance could save him. I don’t need to call 911, I need Ben. She went over to Lulu, who had stopped howling and was emitting a low, steady moan.